Poland Wins! Congratulations to the 2018 IBB Champion: Piotr Oleksy – Deutsche Neurowissenschaften-Olympiade e.V. 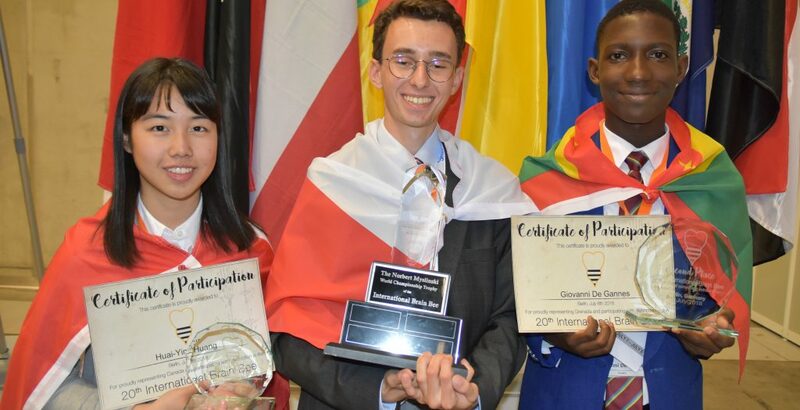 Eighteen-year-old Piotr Oleksy from Poland is the winner of the 2018 International Brain Bee Championship. 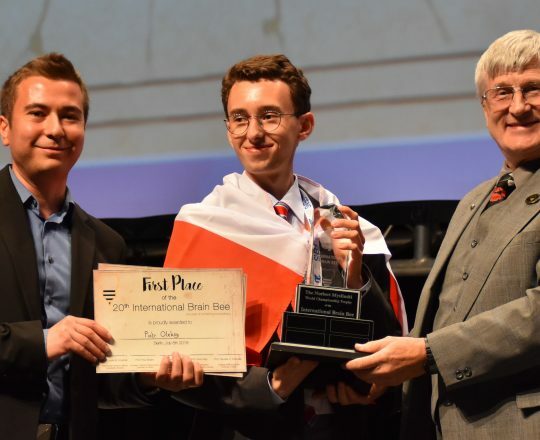 We are delighted to announce eighteen-year-old Piotr Oleksy from Krakow (Poland) as the winner of this year’s International Brain Bee (IBB) Championship held in conjunction with Europe’s biggest brain research conference in Berlin. Second prize winner is fourteen-year-old Giovanni De Gannes from Grenada and seventeen-year-old Huai-Ying Huang from Canada won third prize, followed by 15-year-old Mahsa Arman from Iran in fourth place and sixteen-year old Elaine Cheung from Australia in fifth place. In total, twenty-five finalists from 25 countries took part in the competition. Congratulations to all! Piotr Oleksy pictured with DNO Academic Manager, Dr. Ionut Dumitru, and IBB Founder, Dr. Norbert Myslinski. The 2018 IBB Championship took place with the generous support of the Hertie Foundation. Thank you to our other partners and sponsors including the Deutsche Neurowissenschaften Olympiade (DNO e.V. ), Brain Buds, Matteo Farinella (Nobrow) and Sci-ART; FENS for hosting the Championship at the 11th FENS Forum and and Charité – Universitätsmedizin Berlin as the venue for the Neurohistology and Neuroanatomy Exams. A big thank-you to the local organizing team in Germany led by LaShae Nicholson and the Scientific Sub-Committee led by Ionut Dumitru (both managers at DNO e.V. ), Julianne McCall (special advisor) and Martyna Petrulyte who chaired the Organizing Committee. We would also like to thank the Judges – Drs. Eero Castrén, Leslie Vosshall, Nicolas Caesar Petersen, Imre Vida, Paul Bolam. Finally, thank you to everyone who joined us in Berlin – our national champions, family members, national Brain Bee coordinators, IBB Founder Dr. Norbert Myslinki and other members of the IBB Board. Special notes: This article was originally published on the official IBB website: www.TheBrainBee.org. Please click here to access the press release on the FENS website.